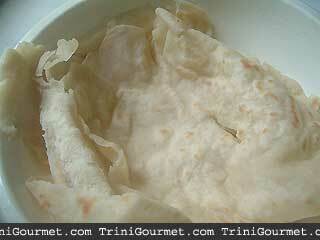 As I mentioned long ago my past attempts at roti making have been nothing short of tragic. My mother has been hiding her tawa away from me for the past few years as a result, eyeing me suspiciously whenever I would plead for the co-ordinates to its whereabouts. I pleaded with every school of logic I could come up with. I was older now, wiser. 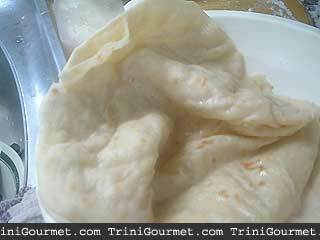 How could I maintain a site called TriniGourmet and not have any attempts at roti? 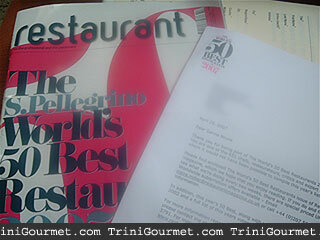 Then, miraculously one morning I entered the kitchen to the sight of a tawa on the stove. Mom nodded yes, she had decided to give me another chance and I could now share ownership. Whee! I made two batches of this and the last of my second batch were worlds above the first of my first batch. This reinforced the fact that with some things there are simply no shortcuts. Practice practice practice. It’s the only way. I monitored the application of oil (more is better), I monitored the heat to see what would happen if i lowered it, if I raised it. If I extended the baking time, and if I reduced it. If I rolled it thinner, thinner, thinner. I made mental notes of what seemed to work and what seemed to hinder. 1. Combine flour, salt and baking powder thoroughly. 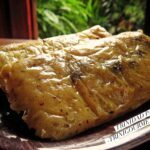 Cover with a damp cloth and let it rest for at least 30 minutes. 3. 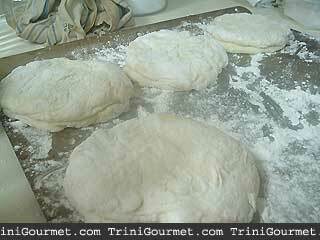 Knead once or twice and Divide dough into 8 even pieces and shape into round balls (loyahs). 5. Flatten loyahs into 3-inch discs between fingers. 6. Brush discs on one side with oil and flour lightly. 7. 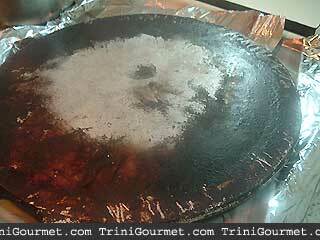 Place tahwa (or flat, thick-based frying pan) on medium heat. 8. Place 2 discs together (oil sides facing) and flatten to 4 inch double discs. Place on floured surface. Rest for at least 10 minutes. 10. Dust rolling pin and rolling surface lightly with flour, and roll out into 8-inch discs, flipping the dough and dusting with more flour to ensure easy rolling. 11. 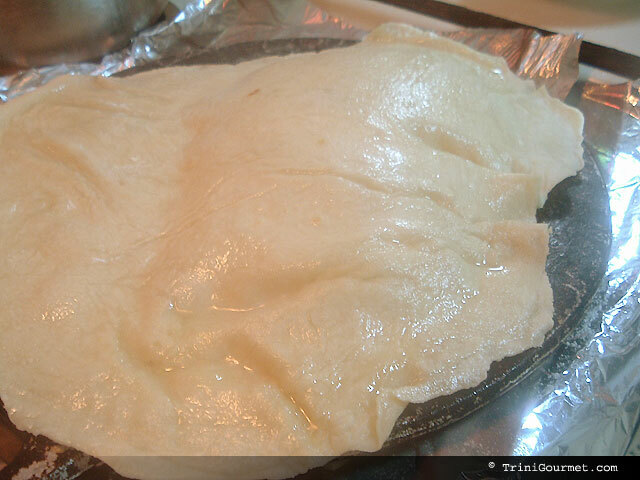 Dust off excess flour and transfer to tahwa. Bake until the first sign of small bubbles appear. Flip with spatula and brush liberally with oil/ghee. Bake until light brown. Flip to other side and brush liberally with oil/ghee. Bake 1 minute. 13. Place back together and store between towels to keep warm.